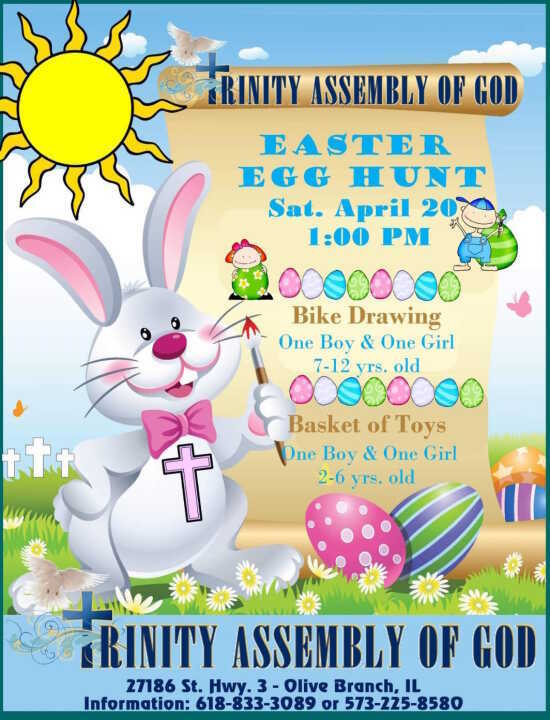 Join us at Trinity Assembly of God on Highway 3 in Olive Branch, IL for an Easter Egg Hunt on Sat. April 20 at 1 p.m. There will be some drawings for 2 bikes one for a boy and a girl ages 7-12 years old, and 2 Basket of Toys for a boy and a girl ages 2-6 years old. There will be refreshments such as Hotdogs and beverages as well. Pastors Stephen and Carrie Clardy invites the public to this event. For more information 573-225-8580 or 618-833-3089.